Asheville, NC – While any Saturday at a brewery involves pints and camaraderie, the addition of glowing eyeglasses and body paint launches one upcoming night into a new category. On July 11, participants in the second annual Night Flight race will run four miles, then cool off with a pint and gear up for a glowing evening. The 2014 race had over 600 runners, raised $13,044 for charity, and hosted a post-race celebration in Highland’s grassy meadow. The beer was well deserved after a four-mile loop through the Beverly Hills neighborhood on a punishing course. But last year, thoughtful residents inspired runners with cheers, signs, and sidewalk chalk. “The course is challenging, but we truly think running should be fun, and the residents of Beverly Hills made sure that happened for the runners. It was great! They had signs, music, and sprinklers, even beers, to keep morale high through the ups and downs of the course,” said Molly McQuillan, Highland’s Marketing Coordinator who also facilitates their Wednesday night Run Club. 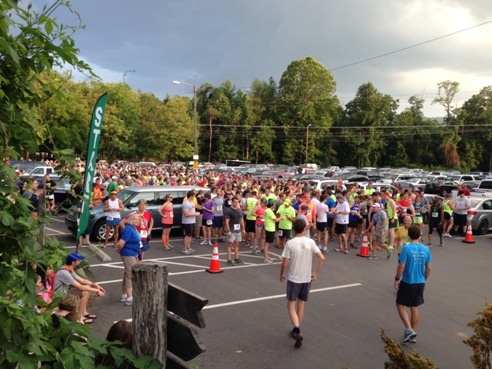 The race is a fundraiser for Asheville Parks and Greenways Foundation (APGF). 100% of the net proceeds from Night Flight will be donated to the organization. “We believe in strong community involvement and are thrilled to be supported by like-minded people. Community-driven events, such as the Night Flight race, help pave the way for more parks and greenway opportunities both present and future,” said Grant DaSantos, Highland Hospitality Manager. Grant also serves on the APGF Board. The APGF will provide volunteers for the event to direct runners, ensuring safety. Long-range greenway plans create an impressive network of paths in city and county. “We are engaged in the city’s short and long term vision for a connected Asheville,” said Highland President Leah Wong Ashburn. Ale Share, Highland’s beer festival on July 25, will also donate 100% of net proceeds to APGF. For free race entries, corporate sponsorships are available. Contact Molly McQuillan at 828-299-3370.